Win-win thinking isn’t easy to apply. Most humans believe that if everyone thought like them, the world would be perfect. Win-win thinking is about letting go of our beliefs, even if we aren’t really wrong by appearances, social protocol, or religious standards. It’s about resisting the temptation to force others to accept or support our perspective of right and wrong. 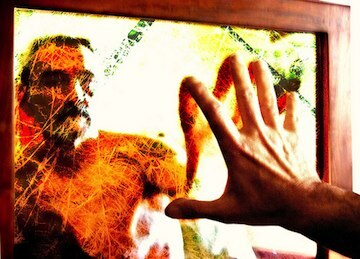 When we force others to think like us, even if we speak the truth, we get a false self connection with them. When we let go, we move into a True Self connection; that’s what we really want with everyone. A True Self connection is our natural state of unity; a false self connection is possession. A few days ago, I was out taking a walk. Two of my housemates apparently got into a discussion while I was gone over the right and wrong of drinking wine. Both of them are Evangelical Christians so you wouldn’t expect them to disagree. The woman said that drinking is wrong because her pastor says so; Jesus drank only grape juice. The man said that Jesus drank wine and even made water into wine. The woman then countered that if Jesus made it, it was special wine, not like the wine we buy at the store. By the time I returned, they were no longer fighting. I didn’t know anything about the disagreement. Soon I learned what transpired while I was gone because each side made comments that showed the argument was still bothering them. My perspective wasn’t even within the scope of the argument so I didn’t get involved. However, comments about the argument kept arising in conversation; I realized that it was time for me to step back and look at the situation from win-win. There was clearly something for me to learn. I couldn’t just ignore the argument even if I wasn’t a participant; I had to make sure my mind was clear of right and wrong. In that way, I could be a clear influence that might help them resolve their conflict more easily. The grape juice argument is clearly win-lose. She was saying that if you drink wine, you’re a sinner. She was wielding her superiority position over the other by saying she was the right one; and he was wrong. Naturally, this didn’t bring out the best in her opponent. This was a familiar situation for me. I’d often been viewed as wrong by others who had strong beliefs. Their rightness depended on my wrongness. They wanted me to submit to their point of view and admit they’re rightness. I could see that people with beliefs assume you are opposing them if you just don’t share their belief. The man who voted for drinking wine had the natural win-win position. The woman could choose juice and not be wrong in his perspective. However, I learned later that he was trying to coax the woman to have a glass of wine. So he compromised his naturally more expansive and win-win position by trying to get her to let go of her position and join him. I’d been here too — often with loved ones. I’d try to push them to let go, and I got caught in their illusionary battle over right and wrong. Now there were two drowning minds in the sea of limitation. I remembered that win-win means allowing the other to have their beliefs and suffer the consequences of them. The goal of initiation was to let go of all beliefs. Initiates didn’t care if others had beliefs because they didn’t believe anything that wasn’t true. They didn’t accept limitation or the notion of right and wrong. 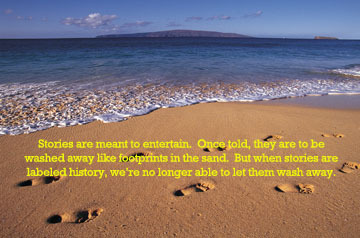 They suggested letting go, but never forced others to do so. When people have a strong belief, they go looking for support. They often want to force the other to support their point of view. If we want support for the truth, we are holding truth as a belief. When we downgrade the truth to a belief, it has no power. We stop feeling the need for support. When we get down to the basics, people have a right to do whatever they want to themselves. Neither the man or the woman’s beliefs were harmful for the other if they each followed their own beliefs. In a world where beliefs still exist, this is often the best possible outcome. Ideally, if the people with the most limiting beliefs always let go and joined the more expansive perspective, we’d soon find ourselves all living in paradise. But not everyone wants to let go at this time. So we must let go of our belief that other people’s beliefs can harm us or limit our life experience. We tend to fear people with stronger or more limiting beliefs because we’ve all had people impose their beliefs on us in the past. We’ve felt our world get smaller when others forced their beliefs on us. If we recognize the beliefs of others as false, they won’t affect our life. We don’t have to accept the beliefs of even one other; and we can let go of those we’ve already accepted. Eventually, those with the least beliefs will lead the best lives. When that happens, we won’t have to encourage anyone to let go. They will see the obvious benefit and motivate themselves. Bottom line…my housemate’s argument was absurd. The very person they fought over said, “Listen and understand! 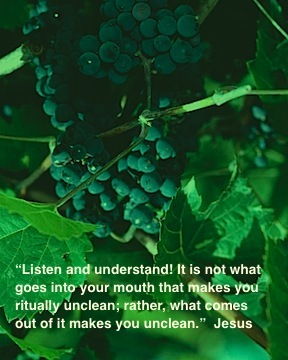 It is not what goes into your mouth that makes you ritually unclean; rather, what comes out of it makes you unclean.” Jesus didn’t care what people drank. He cared what people said or believed. Sadly, my housemates’ disagreement created separation; in truth, they were two friends who loved each other enough to expose beliefs that kept each of them from freedom. They just don’t realize that yet. Each year, in celebration of my Scorpio birthday, I save a copy of Rob Brezsny’s Free Will Astrology column. I’m not fond of traditional astrology. What spews from the mouth of most astrologers is a great description of our prison cell within the illusion disguised as the truth. Many astrologers use their masculine position to keep people in their cells fearing retrograde planets and scary transits if they escape. Our natural desire to be good provides incentive to will our way to the positive side of each sign, planet, and house while avoiding, and therefore projecting, the shadow side on to the world. Rob presents both sides of the illusion and cracks open the gate to allow us to see our way out. He’s an initiate at heart; it comes through in his unusual view of astrology. My birthday horoscope brought me back to a time when I was faced with a difficult life choice. During my business years, I had quite the reputation. 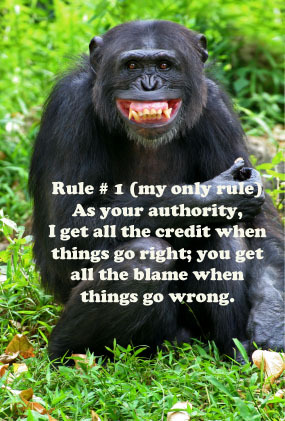 I was an expert — a valued authority. People treated me with respect and admiration. It was actually hard not to think highly of myself. Nearly everyday, I received glowing compliments from people in high places. I could pick up the phone and make things happen. One day, while sitting in my office, I looked at a sign pasted on my computer. “Be anything; just don’t be ordinary.” It was one of those quotes you pick up from inspirational speakers and hear when you attend pump-you-up business conventions. I’d read that quote a million times, but this time I had a moment of sanity. I thought “What’s wrong with being ordinary? Why do I fear it so?” I realized that ordinary was like a demon that stood behind me constantly trying to pull me down. Saying my magic affirmation was what kept that demon behind me. During my time in business, I came to know the ins and outs of the illusion. I knew that with force of will, I could reign like a king over others. I could win at the illusion game. But I realized that little demon would always be there looking for an opening. What if this strange pull to ordinary wasn’t really a demon? Forcing my will never brought me the peace or freedom I truly desired. Oh, I’d leave trails of losers along the way — the Scorpio in me thought that was a divine idea. But I didn’t want to live from win-lose anymore. I decided that I would choose ordinary and strip the power from this seeming demon. I’d no longer avoid ordinary; I’d dive in. At first, I changed my business approach to win-win. Eventually, I sold my business and dropped all my prestigious labels. It was then that I came to realize why ordinary isn’t a happy state. Ordinary (in the illusion) means assuming a feminine role to win-lose powermongers who need losers to win. 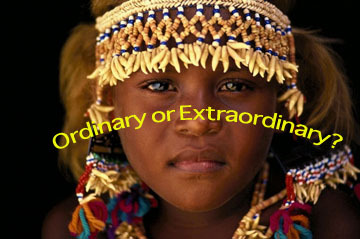 Ordinary means suppressing our God-given value and talents so that others can live an inflated life where their talents or knowledge are perceived as extraordinary. In the illusion, ordinary people are valued for their ability to obediently worship the elite and to suffer with a smile. In truth, being ordinary means being our True Self — as we’re designed. 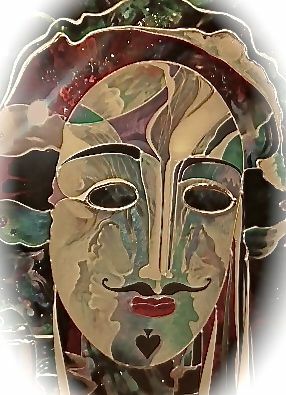 The illusory extraordinary is actually a charismatic mask of power that keeps unconscious people spellbound in false beliefs. While that mask appears to be more powerful than our True Self, it isn’t. The notions of better or worse, superior or inferior, or extraordinary and ordinary aren’t real. Only in the illusion are some talents valued more than others, are experts with knowledge considered greater than non-experts with wisdom, and are those with pedigrees naturally extraordinary. After I made the tough decision to no longer use my ability to play an OSCAR-worthy guru, wizard, or magician, I felt a great loss. I missed the accolades and the money. I missed having people listen to me and trust me. When I wielded my allure, bewitched people with my charm, and gave them knowledge which served the illusion, they adored me. Now that I dropped the facade, spoke the truth, and wanted only win-win experiences, those same people found me odd, wrong, and even evil at times. The illusion also made me outer directed. The art of being ordinary demanded inner direction. I had to let go of all the rewards of the illusion, including my false power and value. That’s why Jesus said the rich won’t get to heaven. Heaven is freedom, our True Self; but when we’re winning in the illusion, it’s hard to leave. As Rob suggests, if I must manipulate, I should do it for the other’s benefit. I do use what looks like Scorpio power to convince people to let go, to be themselves, and to choose love over judgment or hate. I use it to push the seeming extraordinary off their pedestals and to provide some wings for the seeming ordinary until they can fly on their own. I could still dip into the illusion and produce some raw magic, mojo, or charisma at will; but why would I when being ordinary means being my True nature, and being my True Self means being free. Last week, I wrote about my sadness that people are often considered to be badly created or badly raised. As I mentioned, I don’t think it’s that uncommon for people to think of others in that way. However, in America, we wouldn’t dare say what we’re thinking. We’d cover it up with a nice mask. Americans are excellent, silent projectors of judgment. This is an update on those earlier stories and a testimony to how things can change when you let go. 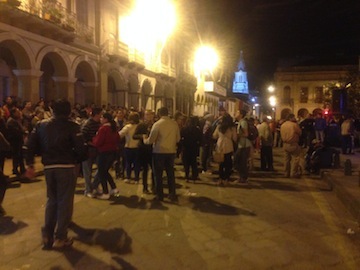 I went to a festival in the center city here in Cuenca (above photo). Lots of people were dancing in the streets to very good live music. A man came up to me and held out his hand. He was an older Ecuadorian man — dirty and very drunk. At first I thought he wanted money, but his hand was turned with the palm down. I knew enough Spanish to realize he wasn’t talking about money. He wanted to dance. I politely said “No,” but he wouldn’t leave me alone. I realized that I didn’t say “No” with enough force. American politeness is often too soft here. So I said, “No, gracias!” (No, thank you) in a slightly louder voice; but still he tried to convince me to dance with him. Just then a young man, who was leaning on a nearby fence, walked over and very gently held the man by the elbow and explained to him kindly that I didn’t want to dance. He walked him away from me and then went back to his place on the fence. There was no force, no anger — just caring and kindness. My mind flashed to earlier images in my life of bouncers beating up drunk men or policemen pushing and yelling at people as they demonstrated their authority. I realized that the young man didn’t see the old drunk man as badly created or badly raised; he saw him as confused. That was how he spoke to him — like he was teaching him rather than punishing him. He saw him as not knowing the proper way to relate to someone outside of his own culture. I walked over to the young man and said, “Muchas gracias,” (Thank you very much) and smiled. He smiled back and nodded. I still can’t think about that interaction without getting tears in my eyes. I realized that the reason we use authority and force to handle things is because of judgment. Authorities see themselves as right and superior; the offender is obviously wrong and inferior. When judgment isn’t present, no force is needed. It’s all so simple. Judgment will always be present, even if unstated, if we believe that other humans can be badly raised or badly created. Thus, if we believe in the notion of original sin or believe that humans fell from grace, then we can’t help but have judgment for others. I realized how lucky I was not to have those beliefs installed in my mind as a child. Before I married, I didn’t know what judgment was. It was a word that I couldn’t comprehend. Occasionally, I attended Catholic church with my husband and his family. I realized that my mind started to judge others at that time. I didn’t like it, and I wondered where the thoughts were coming from. I felt it was from the church because I noticed that people seemed very judgmental after they attended mass. But I kept dismissing my observation because it seemed ridiculous that our mind would become more confused, negative, and hateful after attending what was supposed to be something good and spiritual. Religions all evolved from the idea that humans are flawed and need spiritual training. The notion of initiation, on the other hand, is based on the idea that we are good and spiritual by nature. That goodness can’t be destroyed; it can only be covered with beliefs, creating confusion. Even the worst human isn’t evil in the initiate’s eyes; they just have a thicker layer of illusion covering their True Self. This isn’t only a lesson in how to treat others. It’s a lesson in how to treat ourselves. If we view ourselves as flawed and needing fixing, we’ll hold on to beliefs in problems, suffering, and punishment. We’ll try to use our will to jump over limiting beliefs. On the other hand, if we see ourselves as good and deserving of love, we’ll use our will to eliminate our beliefs. 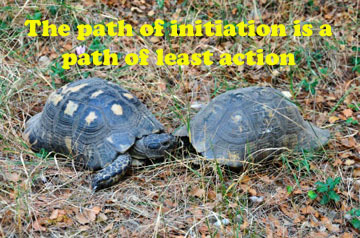 I often have days where I want to give up trying to resurrect the old initiation teachings. I’ll think that I can’t take one more person telling me that viewing humans as innately good and loving is ridiculous. I can’t hear one more person describe humans as physical meat suits that are evolving nicely. But then I witness the natural power of the initiate’s point of view in action, just as I did with that young man. I see my own worldview change as I let go, and I know I can’t go back to looking at others as badly created or badly raised. I can’t go back to thinking that people need fixing. It’s just so much easier to let go and love.